The President of the Republic of Indonesia (Indonesian: Presiden Republik Indonesia) is the head of state and also head of government of the Republic of Indonesia. The president leads the executive branch of the Indonesian government and is the commander-in-chief of the Indonesian National Armed Forces. On 20 October 2014, Joko Widodo became the seventh and current president of Indonesia. The Indonesian presidency was established during the formulation of the 1945 Constitution by the Investigating Committee for Preparatory Work for Independence (BPUPK). The office was first filled on 18 August 1945 when Sukarno was elected by acclamation by the Preparatory Committee for Indonesian Independence (PPKI) because according to the Provisional Act Section 3, "President and the Vice President for the first time elected by PPKI." Also, the body responsible for the presidential elections, the People's Consultative Assembly (MPR), had not yet been formed. On 16 October 1945, Vice-President Mohammad Hatta announced a vice-presidential decree which turned the Central National Committee of Indonesia (KNIP) equal status with that of the president. On 11 November 1945, the KNIP made the decision to separate the role of Head of State with that of Head of Government. Although a new constitution had not been set up yet, Indonesia was now a de facto parliamentary democracy with the president as a ceremonial Head of State whose function was to ask the prime minister as the Head of the Government to form a new Cabinet. During the Indonesian National Revolution, both Sukarno and Hatta were captured by the Dutch in Yogyakarta on 18 December 1948. Sukarno then gave a mandate for Sjafruddin Prawiranegara to form an emergency Government. This was done and the Emergency Government of the Republic of Indonesia (PDRI) was formed in Sumatra with Prawiranegara as its chairman. Prawiranegara handed back his mandate to Sukarno on 13 July 1949. On 17 December 1949, Sukarno was elected president of the Republic of the United States of Indonesia (RIS) and presidential mandate passed to Assaat. When it became clear that RIS was going to be replaced by a unitary state, Asaat stepped down from the presidency and Sukarno once again became president on 15 August 1950. Indonesia now adopted the constitution that had been intended for RIS. Officially known as the Provisional Constitution, the document confirmed the president's role as the head of state, but limited him to a mostly ceremonial role. He appointed a prime minister on the advice of formateurs. Despite his limited constitutional role, Sukarno commanded great moral authority. Nonetheless, he was never content with the role of ceremonial sead of State, and grew increasingly disenchanted with western-style parliamentary democracy. In the early 1950s, he began calling for the implementation of "Guided Democracy," in which decisions would be made after lengthy deliberation with a view toward achieving a consensus under presidential "guidance." The rest of the decade saw a series of unstable governments. Taking advantage of the situation, Sukarno made a speech in April 1959 and suggested that Indonesia return to the 1945 Constitution. The People reacted enthusiastically and there was strong pressure on the Constitutional Assembly, the body responsible for formulating a new constitution, to adopt the 1945 Constitution. When the assembly did not budge, Sukarno issued a presidential decree on 5 July 1959 declaring that Indonesia was returning to the 1945 Constitution. That document made the president head of government as well as head of state. In May 1963, the People's Consultative Assembly appointed Sukarno president for Life. Although Indonesia had re-adopted the 1945 Constitution, it did not mean that it was strictly adhered to. The MPR, which at this stage was still on a provisional basis (MPRS), was subservient to the president despite its status of the Nation's highest Governing Body. It was only in 1966, when the political tide began to turn against Sukarno that the MPRS nominally regained its rightful constitutional status. All throughout his rise to power, General Suharto seemed determined to do things constitutionally and that determination seemed to continue when he became president in 1967. Suharto allowed the MPR to execute its constitutional duty of formulating the Broad Outlines of State Policy (GBHN) whilst he as the president would be responsible for implementing GBHN. Suharto also made it a presidential obligation to deliver accountability speeches towards the end of his terms. During the speech, Suharto outlined the achievements that his administration had made and how those achievements had adhered to the GBHN set by the MPR. Despite the constitutional and democratic façade, Suharto made sure that the MPR was also subservient to him. In 1969, a law was passed that required appointments to the MPR to be made official by the president. He also took measures that largely emasculated the opposition parties. For example, he had the power to issue governmental regulations in lieu of law, which nominally had to be approved by the House of People's Representatives (DPR, the pre-2004 legislative branch). However, given the DPR's infrequent sessions and the near-total dominance of the pro-government political grouping, Golkar, such approval was a mere formality. Thus, for all intents and purposes, Suharto ruled by decree for most of his tenure. For the better part of Suharto's rule, he effectively held all governing power in the nation. Suharto fell from power in May 1998 and the presidency experienced changes as a result of the reform movement. Compared to Suharto, who had all of his accountability speeches accepted, B. J. Habibie had his only accountability speech rejected. Abdurrahman Wahid then became the first president who had to beat another candidate to be elected, as Sukarno and Suharto had been sole candidates. As a result of this, Wahid was also the first president to be elected through counting votes instead of by acclamation. However, Wahid ended his presidency by being impeached by the MPR, a clear sign that while the presidency is the key institution, it is still subservient to the MPR. Wahid was replaced by his Vice-President, Megawati Sukarnoputri, daughter of Sukarno and former opposition leader during Suharto's presidency. Megawati is the first and, so far, only female ever to become President of Indonesia. During the 2001 MPR Annual Session, it was finally decided that from 2004 onwards, the president will directly be elected by the people. In 2004 Susilo Bambang Yudhoyono became Indonesia's first directly elected president, beating incumbent Megawati Sukarnoputri in the runoff election. In 2014, Yudhoyono finished his second presidential term and was barred from seeking re-election. The 3rd Indonesian presidential election was held on 9 July 2014 and matched former general and Suharto's ex-son in law Prabowo Subianto against the governor of Jakarta, Joko Widodo. On 22 July the General Elections Commission announced Joko Widodo's victory. He and his vice-president, Jusuf Kalla, were sworn-in on 20 October 2014, for a 5-year term. The 1945 Constitution: The presidential candidate has to be of Indonesian origin. The Provisional Constitution: The presidential candidate has to be an Indonesian citizen aged at least 30 years old. He cannot be someone who is deemed to be undesirable or has had his right to take part in elections stripped. He is also required to not be involved with any private corporations. The Amended 1945 Constitution: The presidential candidate has to be an Indonesian citizen since his/her birth, who has not willingly become a citizen in another nation, has not betrayed the nation, and is physically and mentally capable of performing the duties. Amended Constitution also states that further criteria will be determined by laws. The president is also required to be nominated by a Political Party or a coalition of Political Parties. have a vision, mission, and programs to execute the office of president. The 1945 Constitution: Together with the vice-president, the president is elected by the MPR with the largest number of votes. The president-elect is also required to read either an oath or a promise of office before officially becoming president. The term of office is five years and after that the president can be re-elected again. The Provisional Constitution: Together with the vice-president, the president is elected according to rules specified by laws. The president-elect is required to read either an oath or a promise or a statement of office before officially becoming president. The president is constitutionally required to live where the seat of Government is. The Amended 1945 Constitution: Together with the vice-president, the president is elected directly by the people on a ticket. Further election rules are determined by laws passed by the DPR. The president-elect is required to read either an oath or a promise of office before officially becoming president. The term of office is five years and after that the president can be re-elected for only one more term. Distribution of Votes: Winners must receive over half the votes total, including at least 20% of the votes in at least half the 34 provinces. Oath of Office of the President of the Republic of Indonesia: "I swear by Allah to fulfill the duties of president (vice-president) of the Republic of Indonesia to the best of my capabilities and in the fairest way possible, to uphold the Constitution by all means and to execute all laws and regulations as straightforwardly as possible as well as to dedicate myself to the service of the Nation and the People." Pledge of Office of the President of the Republic of Indonesia: "I solemnly pledge to fulfill the duties of president (vice-president) of the Republic of Indonesia to the best of my capabilities and in the fairest way possible, to uphold the Constitution by all means and to execute all laws and regulations as straightforwardly as possible as well as to dedicate myself to the service of the nation and the people." The 1945 Constitution: The president has constitutional authority over the Government and has the power to name and remove ministers. He has the power to create laws with the agreement of the People's Representative Council (DPR), to make Government regulations in accordance with laws, and in the case of emergencies has the power to make Government regulations in lieu of law. Militarily, the president holds supreme authority over the Army, Navy, and Air Force whilst security-wise, the president has the power to declare a State of Emergency. Diplomatically, the president, with the agreement of the DPR, has the power to declare war, peace, and to sign treaties. In addition, he or she appoints ambassadors and consuls as well as accepting ambassadors from other countries. Finally, the president has power to give amnesties and pardons as well as awarding titles and honours. The Provisional Constitution: The president has the power to name cabinets and appoint the prime minister with the advice of formateurs. The president is able to remove ministers from office and has the right to be informed of important matters by the Council of Ministers. As the head of state, the president has the power to dissolve the DPR and order for an election to be held within 30 days. Militarily, the president holds supreme authority over the Armed Forces although any decision on this matter needs to be countersigned by the appropriate ministers and wartime control of troops has to be placed under an Armed Forces Commander. The president requires permission from the DPR to declare war and sign treaties although he or she has independent power to appoint ambassadors and to accept them. The president also has the power to grant pardons. The Amended 1945 Constitution: The president has constitutional authority over the government and has the power to name and remove ministers. He or she has the right to propose bills to DPR, to discuss bills with the DPR to reach an agreement, make government regulations in accordance with laws, and in the case of emergencies has the power to make Government regulations in lieu of law. 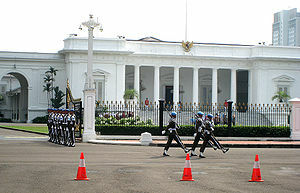 Militarily, the president holds supreme authority over the Indonesian National Armed Forces. Diplomatically, the president can only sign treaties, appoint ambassadors, accept ambassadors from other countries, rehabillitate prisoners, and appoint Judicial Committee members with the DPR's agreement. The president has the power to grant pardons but must consider the advice of the Supreme Court. The president also has the final say over chief justice candidates. The 1945 Constitution: The president is assisted by the vice-president and his or her ministers. The president is also able to seek advice from the Supreme Advisory Council (DPA). The Provisional Constitution: The president is assisted by the vice-president. The Amended 1945 Constitution: The president is assisted by the vice-president and his ministers. The president is also allowed to form his own advisory teams which will further be regulated by laws passed by DPR. The 1945 Constitution: If the president dies, resigns, or is unable to perform his/her duties for any reason, he/she is replaced by the vice-president. The Provisional Constitution: If the president dies, resigns, or is unable to perform his/her duties for any reason, he/she is replaced by the vice-president. The Amended 1945 Constitution: If the president dies, resigns, or is unable to perform his/her duties for any reason, he/she is replaced by the vice-president. If the president and the vice-president die, resign, or are unable to perform their duties for any reason, the government will be taken over together by the minister of foreign affairs, minister of internal affairs and minister of defence. Then the MPR will elect a new president from the two candidates nominated by the political parties whose candidates were the winner and the runner-up in the previous presidential election. Under the amended constitution, the president can now be impeached and removed from office. If the president is viewed to be unfit to perform his duties and has committed crimes such as corruption or betraying the nation, the DPR can appeal to the Supreme Court to try the president. Furthermore, the DPR can ask the Constitutional Court to look into the matter, during which it has 90 days to make a decision. With the decision made, the DPR can motion for the MPR to convene. The president would then be given one last chance to defend himself before the MPR makes the decision whether or not the president should be impeached. Law 7 of 1978 stipulates that former presidents are entitled to a pension. Former presidents are also entitled to a house with electricity, water, and telephone bills covered by the government. In addition to that former presidents will have free healthcare for their families and a car with chauffeur. Assaat (17 December 1949 – 15 August 1950) – during the United States of Indonesia, Sukarno became the president of the United States of Indonesia. The Republic merely a component of the union. Sukarno (from 15 August 1950) – upon (re)-establishment of the unitary Republic of Indonesia. As of 15 December 2018[update], there are three living former presidents. The most recent death of a former president is that of Abdurrahman Wahid (1999–2001) on 30 December 2009. ^ "Megawati Digaji Rp 112 Juta, Lebih Besar dari Gaji Presiden". KOMPAS (in Indonesian). 28 May 2018. Retrieved 17 July 2018. ^ "Bendera Kepresidenan Bung Karno". Rakyat Merdeka (in Indonesian). 11 April 2017. Retrieved 7 February 2018. ^ Djalal, Hasjim (16 August 2002). "Mengenang Dubes Palar dan Diplomasi Indonesia". Kompas. Archived from the original on 16 March 2005. Retrieved 12 March 2007. ^ "Temporal Constitution of Indonesia 1950". Ministry of Finance of Indonesia. 15 August 1950. Retrieved 12 May 2015. ^ Ricklefs, M.C. (2008) . A History of Modern Indonesia Since c.1300 (4th ed.). London: MacMillan. p. 454. ISBN 978-0-230-54685-1. ^ "Law of Indonesia Number 6 Year 1969 (UU No.6/1969) about The composition and rating of People's Consultative Assembly, People's Representative Council and Regional People's Representative Council". Hukum Online. 17 December 1969. Retrieved 12 May 2015. ^ John Aglionby (July 2001). "Special report: Indonesia and East Timor". Retrieved 12 May 2015. ^ "MPR dan Pemilihan Presiden Langsung". VOA Indonesia. 6 November 2001. Archived from the original on 25 August 2006. Retrieved 20 July 2004. ^ NEHRU, VIKRAM; BULKIN, NADIA (24 October 2013). "How Indonesia's 2014 Elections Will Work". Carnegie Endowment for International Peace. Retrieved 23 March 2017. ^ Laurencius Simanjuntak (22 January 2010). "Wapres Bisa Jadi Presiden, Kemudian Memilih Wakilnya". detikNews. Retrieved 12 May 2015. ^ "Law of Indonesia No. 7 Year 1978 (UU No.7/1978) about Rights of Finance/Administrative President and Vice President, and Former President and Vice President of the Republic of Indonesia" (PDF). National Library of the Republic of Indonesia. 18 December 1978. Retrieved 12 May 2015.